Only the best and naturally pesticide-free raw materials. Regularly checked by independent institutions. Quality management from production to sales. Paired hygienic packaging in environmentally friendly cellulose foil. Just like in the wellness center Earcandling uses the deep relaxing effect of the application with BIOSUN ear candles, matching scents and specially tuned music. This trend is also increasingly found in beauty salons, beauty salons, nail studios, hairdressing salons and pedicure studios. Whether in combination with existing treatments, for example facial massages, or as an independent treatment for deep relaxation. 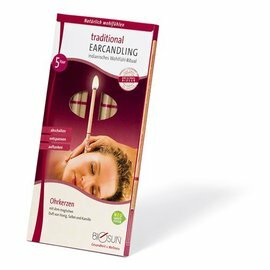 For more than 30 years, BIOSUN Ear Candles have been successfully used in naturopathy. 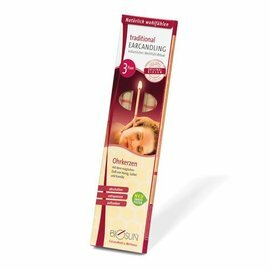 The ear candles are successfully used by naturopaths, physiotherapists, midwives, health centers and many other health professionals. Ear candles are rooted in the age-old culture of indigenous peoples. They were originally used as a traditional natural resource and in spiritual rites. But while our ancestors often lived in harmony with nature, we seldom allowed ourselves the necessary rest, for this reason more and more people return to old traditions and they discover the joy of traditional treatment with ear candles. In a simple and natural way this ritual leads to a holistic relaxation for body, mind and soul. Calming warmth, enchanting smells, soft noises and the quiet crackle of the ear candle flame lead to three senses - feeling, smelling, hearing. Those who enjoy traditional treatment with ear candles slowly slide into a deep state of relaxation. 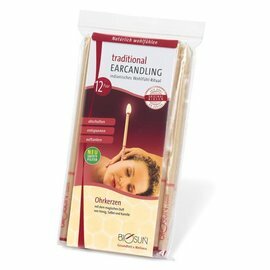 BIOSUN EAR CANDLES @ NATURAL BIO STORE!